Parklands Day Nursery sits nestled in it’s own rural setting, set back from a quiet road and surrounded by our glorious Cheshire countryside. We offer a loving and caring environment, supported by our fantastic staff and complimented by our home cooked food. The nursery atmosphere is relaxed, friendly and homely, yet organised and structured to enhance a range of social, intellectual, physical and emotional skills. Every child is encouraged to reach their full potential through praise, sensitivity and respect. We may provide different sessional hours upon request and will be as flexible as possible. We are open 52 weeks of the year and only close on bank holidays. Click this link to see if you can get any help with your childcare costs. 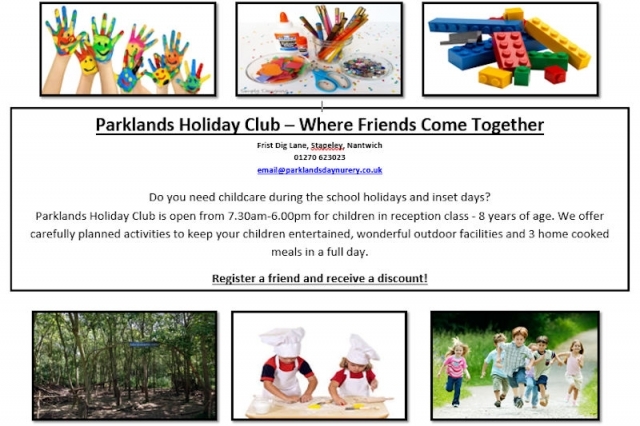 Parklands’ new Holiday Club is opening this half term. Full day or shorter day option available. Contact us to find out more. "The outdoor environments are unbeatable and great indoor areas. They are used well for creative and imaginative play." "It is very reassuring to be able to leave the children knowing they will be happy and well looked after." "It’s amazing how you do so much with the children…..outdoors, messy play, cooking, making bird pictures." 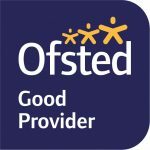 Click here to download the latest Early Years Register inspection report from Ofsted.